Broward students who need medical marijuana are allowed to receive it in school. Broward County Public Schools ruled Tuesday that students who need it can take medical marijuana during schools hours and on campus. The medicinal pot, usually in an edible or lotion/oil form, can be administered by a parent or registered caregiver. Students who qualify for medical marijuana can now receive it during school and on campus, the Broward County school board has ruled. 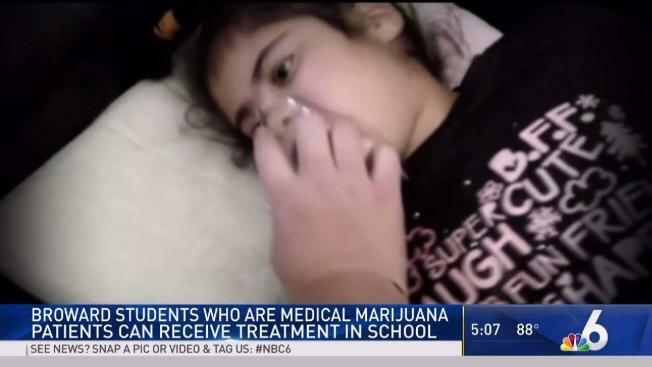 The board's decision, unanimously approved Tuesday, means kids like Rebecca Hyman, who suffers from dozens of epileptic seizures a day, can now receive medical marijuana at school. "Broward County Schools took a very unique, bold step to establish policies, they were one of the first school districts to do so," said Rebecca's father, Seth Hyman. Seth Hyman has become a medical marijuana activist, fighting for kids like his daughter. Medical marijuana, he says, cuts the number of his daughter's seizures by half. "Any step is a step in the right direction, you have to start somewhere," he said. Medical marijuana, which comes in either an edible form or as a lotion or oil, can be administered at Broward schools by either a parent or registered caregiver. "Many of our students, without the medical marijuana, can't function in school due to epilepsy," said school board member Robin Bartleman. "I know many parents personally who have kids who have seizures, and this was very important to them so their children can have an opportunity to attend school." Because medical marijuana is still against federal law, Miami-Dade schools do not have a similar policy because the board is afraid of losing federal funding. Broward School's policy has a provision in it that states if the county is at risk of losing funding, the board can withdraw the policy altogether.